The awareness event is part of the sensitisation program to impart basic knowledge to the dealers associated with electrical and electronics instruments about e-waste, ever increasing ecological and environmental concernsas a result ofwrong methods of disposal mechanisms being practiced for such waste. The programme elucidated on the discrete steps of recycling and correct disposal of e-waste at different levels and the broad responsibilities of associated dealers. The event saw attendance of more than 25 participants at Holiday Home in Ranchi. 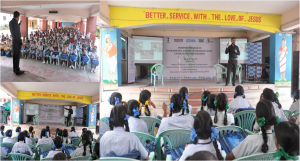 The awareness event is part of the sensitisation program to educate the teachers, students and parents about e-waste, escalating environmental issues consequential to the improper disposal of such waste. The programme threw light on the discrete steps of recycling and correct disposal of e-waste at different levels.